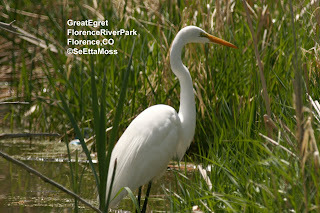 Yesterday I also found this Great Egret, the first I have seen this year and the first reported in Fremont County, CO. 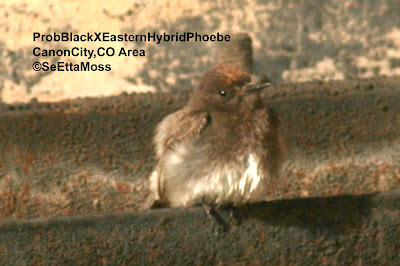 It was feeding in the wetlands in a small park in Florence, CO which is less than 10 miles from Canon City. 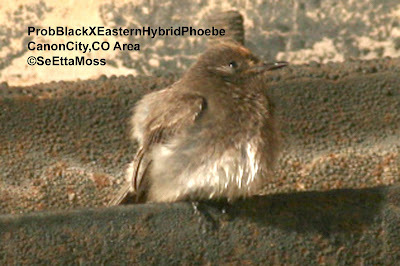 I found this probable Black/Eastern Phoebe hybrid today at my friend's in the Canon City,CO area. It has bright brown, almost rust colored, forehead feathers. The dark body feathers are from dark brown to charcoal and it has a breast dark on the top and white beneath, separated by an inverted 'v' found in Black Phoebes (as it's feathers were ruffled in the pics, I cannot tell how close to a 'v' this is).